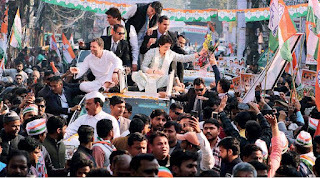 Making her political debut as AICC general secretary, Priyanka Gandhi started her Uttar Pradesh roadshow, with people cheering as she rode in an open truck through Lucknow. Shiromani Akali Dal’s Bikram Singh Majithia said that Rahul’s “political obituary” had been written with the launch of his sister’s entry into active politics. Meanwhile, Robert Vadra, in a social media post on Monday, urged people for the safety of his wife, saying the political atmosphere is “vindictive and vicious”.